Earlier this year, Robert Putnam, the Harvard sociologist noted for his "Bowling Alone" thesis that community associations create "social capital" which improves their communities, issued a report titled "E Pluribus Unum: Diversity and Community in the Twenty-First Century." Using data from 2000 Social Capital Community Benchmark Survey, Putnam concluded that diverse communities and neighbors have significantly less social capital than culturally homogeneous ones because people in diverse communities tend to "hunker down" and isolate themselves from their neighbors. Nevertheless, Putnam argues that social diversity and multiculturalism have huge social benefits and should remain goals that we aspire toward in our communities. One effective strategy for combating this "hunkering down" is the development of vibrant, welcoming public destinations in our communities. Putnam writes, "To strengthen shared identities, we need more opportunities for meaningful interaction across ethnic lines where Americans (new and old) work, learn, recreate, and live. Community centers, athletic fields, and schools were among the most efficacious instruments... a century ago, and we need to reinvest in such places and activities once again, enabling us all to become comfortable with diversity." Project for Public Spaces is committed to promoting parks, plazas, markets, civic buildings, business districts and neighborhoods as a way to bring people together. These places are critical for building relationships and creating communities. In public spaces, we escape the insular environments of our work and home land enjoy the opportunity to meet our neighbors, visit old friends, and encounter other people. Even when we feel like keeping to ourselves -- simply walking through a park or downtown on our own--the experience of being out in public creates an experience of togetherness that contributes to the sense of community. Social scientists as well as planners and community organizers argue that public places are essential to community's success, and that neighborhoods with vibrant public spaces have greater levels of social capital than those cities and towns with few public destinations. The same principle holds true for vibrant multicultural communities: public spaces have the potential to bring people of many different cultural backgrounds together. People have the opportunity to experience togetherness--which can help break down the social barriers that far too often divide us. Many studies have been conducted to understand the ways different ethnic and cultural groups relate to public spaces. Since we live and work in a world that is increasingly diverse and multicultural, a clearer understanding of how various populations (defined by race, ethnicity, income, socioeconomic status, age, or other indicators) use public spaces and what cultural values they attach to them will benefit planners, policymakers, social scientists, community organizers, as well as citizens themselves. Based on the studies that have been conducted since the mid-1970s, two dominant theses have emerged to make sense of the reasons cultural groups use public spaces. Ethnicity Theory This explanation essentially argues that varying patterns of use in public spaces is the result of differences in cultural values attached to a space or activity, not merely differences in access. For marginality theorists, equity issues can either facilitate or prohibit use of the public realm. Knowing the degrees to which different groups can access elements of the built environment--as well as knowing some of the structural and cultural barriers at work in any community--is important for understanding how an idea such as "placemaking" can be applied to make a difference in the lives of people. Subscribers to the ethnicity theory, conversely, assert that more time and energy needs to be focused on designing places that are reflective of the diverse cultural values and preferences of particular communities. From this perspective, it's erroneous to assume that there is an ideal way of designing and programming a space to attract users. The "best" plan for placemaking is one that results from extensive and continuous community participation and ultimately is flexible enough to accommodate shifting preferences and values over time. A third less popular--though no less real or important--theory explaining differences in use is the discrimination thesis. According to this view, particular cultural groups may choose not to engage in certain activities or visit certain public places because they do not feel welcome in the space due to the experience of discrimination or the expectation that discrimination will occur. Surveys have shown that some people of color have experienced overt hostility by both other users and management staff, ranging from racist utterances to violent actions. In this sense it is not that certain groups inherently do not value certain types of public places, it is rather that the places in their communities are neglected and therefore may not be or feel safe, comfortable, or fun to use. One lesson that that all three of these perspectives point to is the idea that the physical aspects of the built environment--although critical to a place's success--should be viewed alongside, and perhaps even secondarily, to the creation of a welcoming social or cultural space. Latino urban planner James Rojas describes how Mexican and Mexican American communities in East Los Angeles succeed in placemaking and building community even when there is very little attention from planners and public officials to urban design in these neighborhoods. Similarly, in their book Rethinking Parks: Public Space and Cultural Diversity (University of Texas Press, 2005), Setha Low, Dana Toplini and Suzanne Scheld argue that the most successful multicultural public spaces are not necessarily the ones with the snazziest physical design or the most amenities. More important is the creation of a space where people's identities are affirmed and where people feel they can use the space with out feeling conspicuous or looked down upon by people of different cultural groups. In short, a 'successful' multicultural environment is one where various group's sense of comfort is combined with good physical design to create an atmosphere that can nurture many preferences; a place that fosters social interaction while simultaneously creating distinct "spaces" where individual cultures can be emphasized and celebrated. While studies of public places conclude that groups have the tendency to self-segregate, the same studies point to certain elements of the built environment where divisions dissolve and people naturally come together. Public markets, playgrounds, boardwalks, streets, and beaches are arguably the most successful types of "multicultural places" because they can foster the kind of organic interaction between people that placemakers, social scientists, and cultural theorists consider so critical to the development of community across social divides. Public markets are often among the most socially diverse of public places, bringing people of different ages, genders, races, ethnicities, and socioeconomic status together for the experience of food, shopping, and conversation. PPS's report "Public Markets as a Vehicle for Social Integration and Upward Mobility", funded by the Ford Foundation, examined eight markets around the United States--ranging from weekend farmers' markets to outdoor flea markets to traditional market halls--and concluded that public markets hold special power in communities in so far that "public markets enhance the potential for social interaction in public spaces--attracting diverse income levels, ages, and ethnicities--and thereby create a sustainable vehicle for upward mobility and individual empowerment for low-income communities." PPS's research discovered that the cultural composition of the vendors often influences the demographics of the customer base: in general, the greater the variety of vendors the greater the diversity of the clientele. For some immigrant communities where language and socioeconomic barriers may compound feelings of isolation, public markets provide a much-needed venue for connecting with a familiar community while simultaneously offering food at affordable prices. The rising trend to accept WIC vouchers and food stamps at farmers markets is an additional step in the right direction, reflecting a commitment not only to diversity but more importantly, to social justice. 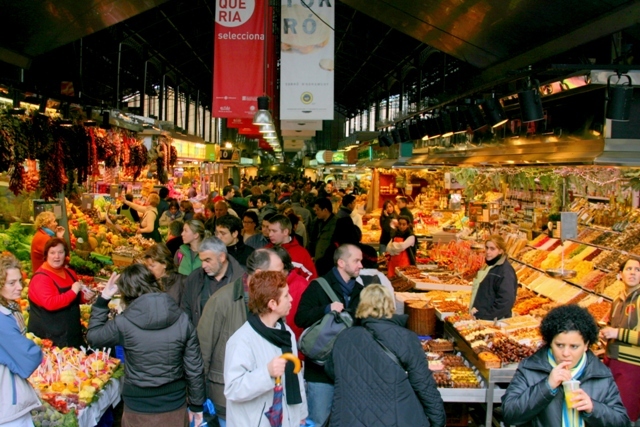 In short, the value of public markets as multicultural places should not be underestimated. They bring people with different backgrounds together while promoting sustainable food production and offering the opportunity to launch local small businesses. "Public markets are valued because they create common ground in the community, where people feel comfortable to mix, mingle, and enjoy the serendipitous pleasure of strolling, socializing, people watching, and shopping in a special environment," PPS research found. "The children's playground is the closest thing to a melting pot a neighborhood can have. People of different races and ages were spotted engaging in friendly conversations... the joys and agonies of raising children provide some common experiences that all parents can relate to and often want to share," writes Anastasia Loukaitou-Sideris, department chair in urban planning at UCLA. Her 1996 study of uses and activities in Los Angeles parks revealed that one of the most popular activities among all racial groups was watching children on the playground. Presumably parents are attracted to the activity because it allows them to share stories and strategies with each other while their children play together. In 2003, Loukaitou-Sideris conducted another study of public spaces in Los Angeles, this time focused on intergroup relations among children. Playgrounds were ultimately found to "promote interaction, exchange, and comfort for a wide range of children... [catalyzing] changes and [making] diverse communities more livable and exciting for young people." While research projects focused on the preferences that adults attach to public spaces often depict a variety of values, Loukaitou-Sideris's piece, titled "Children's Common Ground" discovered that youth, regardless of cultural background, had quite similar ideas about the importance of public spaces and use them in similar ways. Common values included recreational and sports opportunities, spending time in nature, and meeting new friends. Playgrounds allow interaction among different cultural groups to begin during childhood, and continue on into parenthood. Creating public places that promote the discovery of common ground are essential for building communities that transcend cultural divides and promote a sense of inclusion. Beaches are an interesting example of the public spaces that reflect the diversity of our society because they often function as a multicultural space in which individual cultural groups are spatially divided along the length of the waterfront -- often by age, ethnicity, and/or the social composition of the group (for example, families versus groups of teens). Many different groups are represented on public beaches, but they do not necessarily intermix. In 1977, PPS conducted a user study of Jacob Riis Park in Queens, New York, and discovered that groups self-segregate along the individual bays of the beach--multi-ethnic teen groups at one bay, homosexual men another, and families a third. In 2004, the Public Space Research Group at CUNY drew similar conclusions about the park--the territorialization of the beach remains the same twenty five years later. The conclusion suggests that successful multicultural spaces need not necessarily be "melting pots." As important as places where different people mix together are other places where people can spend time cultivating relationships with others in their own unique cultural group. Although beach studies often reveal self-segregation, territorialization is not the rule. The social composition of some public beaches show different patterns than at Jacob Riis park. A weekend visit to Seaside Park in Bridgeport, CT found people from many different backgrounds utilizing the same space comfortably. Beaches do represent truly public environments by virtue of the fact that they are accessible regardless of socioeconomic status. Regardless of how people organize themselves in the space, beaches are a place where an inclusive environment persists. PPS's Riis Park report referred to the beach's boardwalk as the "spine" of the space because it created a common meeting ground for everyone who visited the park. Because racial and ethnic segregation often corresponds to the territorialization found on beaches, boardwalks and promenades are critical sites for social integration because they bridge divides between groups of people. Boardwalks usually feature concession stands and cafes, which attract people from all walks of life. A great example of this is Coney Island in Brooklyn, where the presence of food and entertainment along the boardwalk effectively draws a diverse crowd into a common space where vibrancy and spontaneous interaction characterize the social landscape. To date, there has been little research conducted that focuses specifically on boardwalks and promenades as public spaces. But given the notion of these places as "spines" and connection points, their significance should not be ignored. Offering favorite activities ranging from people watching simply walking along the waterfront, these pedestrian corridors are an important element of the built environment in terms of fostering multiculturalism and social diversity. Courtney Knapp is a former Project for Public Spaces intern.